A rapidly growing body of evidence supports the premise that neuroinflammation plays an important role in initiating and sustaining seizures in a range of pediatric epilepsies. Clinical and experimental evidence indicates that neuroinflammation is both an outcome and a contributor to seizures. In this manner, seizures that arise from an initial insult (e.g., infection, trauma, and genetic mutation) contribute to an inflammatory response that subsequently promotes recurrent seizures. 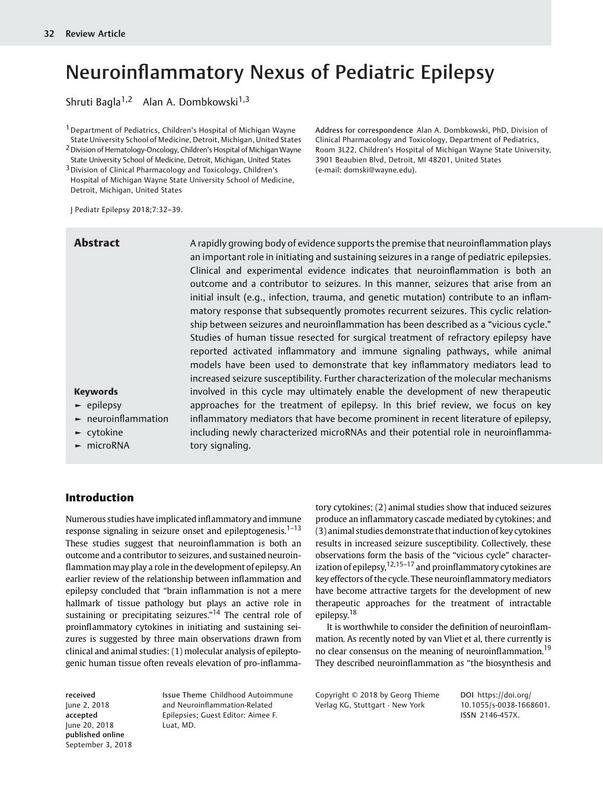 This cyclic relationship between seizures and neuroinflammation has been described as a “vicious cycle.” Studies of human tissue resected for surgical treatment of refractory epilepsy have reported activated inflammatory and immune signaling pathways, while animal models have been used to demonstrate that key inflammatory mediators lead to increased seizure susceptibility. Further characterization of the molecular mechanisms involved in this cycle may ultimately enable the development of new therapeutic approaches for the treatment of epilepsy. In this brief review, we focus on key inflammatory mediators that have become prominent in recent literature of epilepsy, including newly characterized microRNAs and their potential role in neuroinflammatory signaling.